Jan 29, 2019 Find equipment for all ages available for loan, demonstration and reuse. 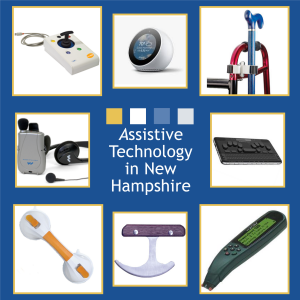 Assistive Technology in New Hampshire (ATinNH) has just unveiled their new online equipment database, NH AT4ALL, where you can browse at your leisure for needed devices. Create your profile and start browsing devices to request today! There is a video overview of how to use the site from a similar program in Idaho. Sign up for a free account with NH AT4ALL. ATinNH is a project of the UNH Institute on Disability and provides training, education, and outreach programming as well as equipment demonstrations, loans, and refurbishing. Check out the ATinNH website. Thanks to Assistive Technology in New Hampshire for the information in this post.